In Pocket Watches > Show & Tell and Tools and Hardware > Keys > Show & Tell. Pocket watches did not always wind and set at the pendant (winding crown or stem). A lot of people are surprised to learn that a key was used at one time. 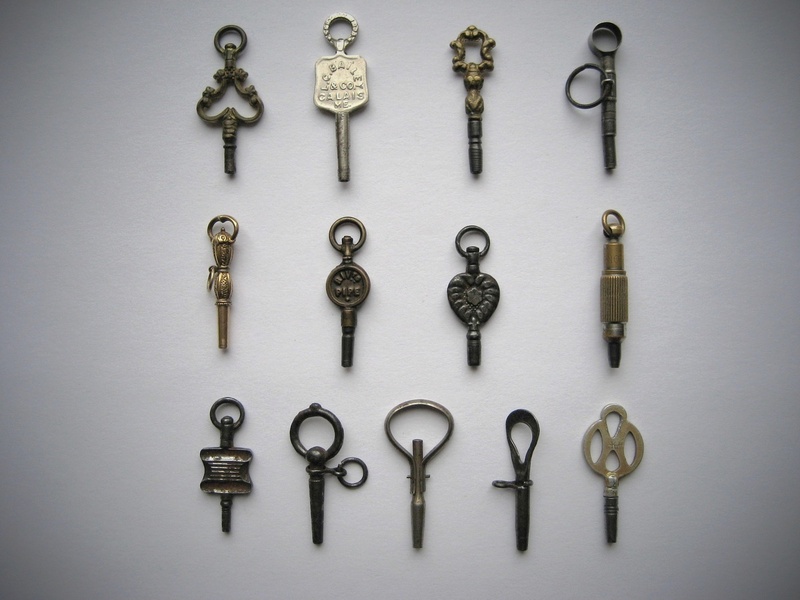 There were many types of keys from fancy ones to advertising ones and the wealthy sported gold ones. There were also ratchet type keys to make winding easier. Key sizes varied since they had to fit the different size arbors on the watch. They were usually around a inch and a half in length and were attached to the pocket watch chain or chatelaine. 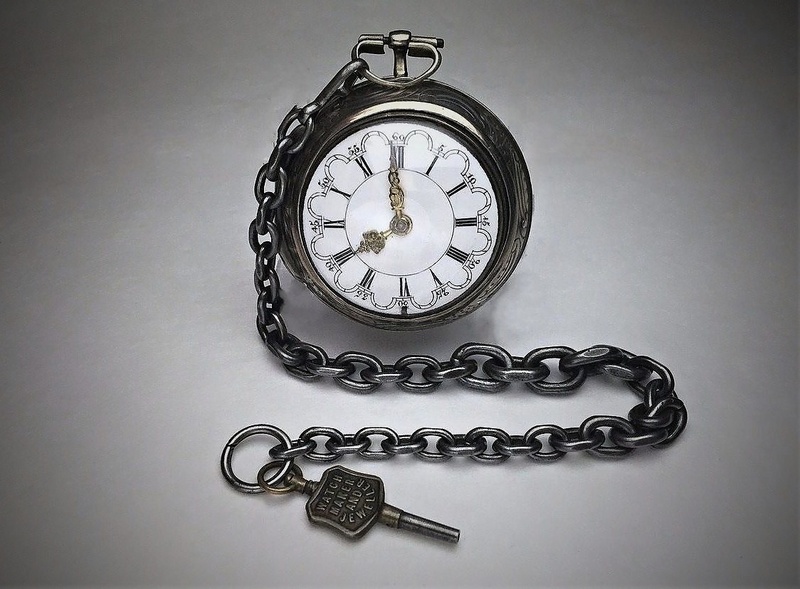 The very first pocket watches, since their creation in the 16th century, up until the third quarter of the 19th century, had key-wind and key-set movements. A watch key was necessary to wind the watch and to set the time. This was usually done by opening the caseback and putting the key over the winding-arbor (which was set over the watch's winding-wheel, to wind the mainspring) or by putting the key onto the setting-arbor, which was connected with the minute-wheel and turned the hands. Some watches of this period had the setting-arbor at the front of the watch, so that removing the crystal and bezel was necessary to set the time. Second photo is an English verge fusee with a steel chain and key for winding and setting. I do use these keys to wind my antique pocket watches. I hope you find this post of some interest, thanks for looking. VERY neat array of keys, thanks for sharing these. 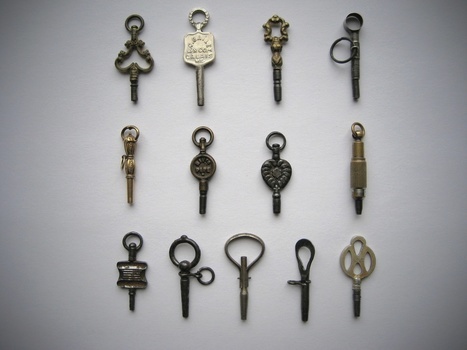 I'd love to put these charming keys in a little antiquey shadow box type frame, maybe arranged on a velvet background. They are so pretty! These are stunning pops !!!! these would look great framed and matted. to hang on a wall. cool. I have probably seen these in antique stores and had no idea what they were. I also love old keys and have several hundred but never thought about watches. I know I have some with the small square tapered end and some with a square hole in them. I'll have to check them out. Ken, I love your collection of watch keys & your fine explanation of their use. I've collected a few and will post them if you don't mind. Hi pops, these are great keys! I'm pretty sure that before I came onto this site that I was even aware keys were made for pocket watches... I always just admired the watches from afar.